To get this app up and running quickly, we’ll use HyperDev, a service that lets you write and run Node apps directly from the browser. 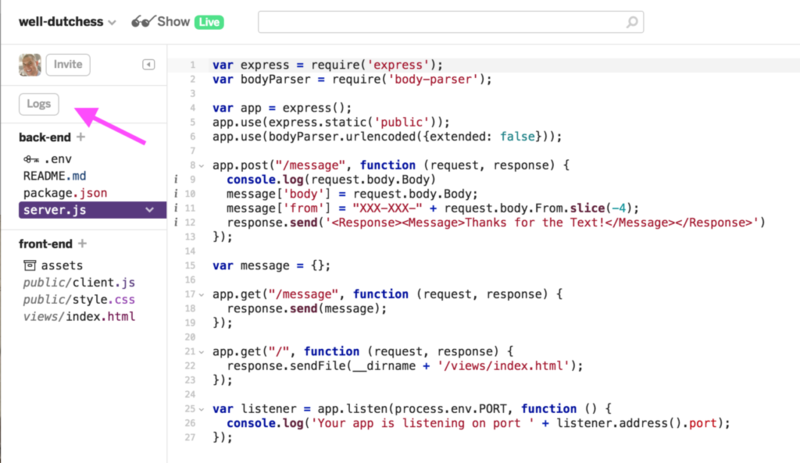 First we create an Express app and include body-parser to parse the inbound HTTP request. log request.body to the console. This contains the all message details from Twilio. send an HTTP response back to Twilio. This response takes the form of TwiML and tells Twilio to send a reply message. Serve up a homepage. Okay, this is just so I could give you that fancy “Remix” button. You don’t really need this. Start the server. You do need this. Click the logs button above the file-tree. Here’s where we’ll see our request body along with any errors that happen during development. Click the Show Live button above the Logs button. Your project is now running at http://your-space.hyperdev.space (actually, it’s been running this whole time). Copy your app’s URL to the clipboard. You’ll need a Twilio account. You can sign up for a free trial account here. Buy a number. At the end of that process you’ll be asked to Setup Number. 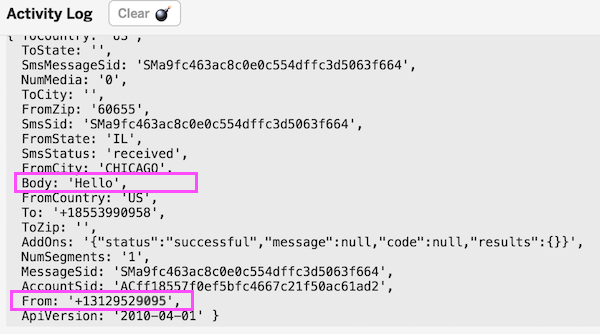 Scroll to the Messaging section and find the line that says “A Message Comes In.” This is where you plug in the URL of your Node app. Paste your HyperDev project’s URL into the box and append the /message. (i.e., https://your-space.hyperdev.space/message). Click Save. the body of the inbound message. This is in response.body.Body. the phone number the message was sent from. This is in response.body.From. HyperDev will automatically save the file and restart your server when you make a change. Text your number again and check out the much easier to read logs. If you have any questions, drop me a line at gb@twilio.com.